Next Article Rangers v Ufa: Can the Gers have the last Laff? We've seen and heard a lot since Steven Gerrard became the Rangers manager pretty much exactly three months ago. As much as the sheer profile of Gerrard the player excited even the most negative of Rangers fans, there were understandable doubts and scepticism. This was a untried manager with only 18 months as a youth coach on his CV. Sure, Gerrard had incredible success as a player but there were (still are?) no guarantees about his managerial prospects. Rangers, running off the back of financial and legal issues for the best part of ten years, and challenging the modern 'invincibles' of Celtic - seven league titles in a row, including an unbeaten sixth title and a double treble - was surely no place for a young manager making his way in the game to learn his trade. After all, this challenge almost broke Graeme Murty, another young man with only a background in youth coaching. Yes, their playing careers were very different but the risk for the Rangers board and their Director of Football Mark Allen, was surely needless? Many neutrals said as much and, if we're honest, really honest with ourselves, we all had the same concerns. Very quickly though, this just seemed different. Gerrard's unveiling in May was the first chance we got to hear the man explain his reasons for taking the job and right away the Rangers supporters took confidence from the way he dealt with the media. This wasn't a man to shirk a challenge. This was an icon, a British footballing legend, who understood the scale of the job and appreciated how difficult it was going to be. 'Let's Go' was an unplanned soundbite but it fit the background well, kept things very simple and inspired fans. Since then progress has been swift. Dozens of transfers in and out of the club. Training camps in Spain with double and triple sessions to improve fitness, tactical awareness and build relationships. Twelve competitive games (nine in August alone) - six wins, six draws and, impressively, zero defeats. In fact, take away some questionable refereeing at home and abroad (and some questionable discipline from one or two players) then that record could and should have been better. Indeed, only two injury time goals away at Aberdeen and Motherwell have stopped Rangers from having the perfect league record to compliment their qualification for the Europa League Group Stage. It's literally been a case of blink and you'll miss it when watching Rangers so far this season. At the time of writing on Friday evening, Gerrard has signed 14 players and moved on 16 first team players. The turnover has been astonishing and, so far, the results impressive with a new defence the pick of the new manager's work. Rangers supporters are delighted and despite some understandable imperfections as Gerrard builds a new squad and system, confidence is building like no other period in the last six or seven years. However, with a two week international break on the immediate horizon, I think fans are looking to take a breath. And the players, especially our central defenders and main striker, certainly deserve the rest. Last weekend at Fir Park, the second half in a quite incredible game took a lot out the team and having to play 30mins with nine men nine hours away in Ufa on Thursday is again asking an immense amount out of this new squad. Yet, we have one more hurdle still to face. One more jump to make. Another tough test to pass - the toughest yet. On Sunday, the team will make the short journey across the Clyde to Parkhead to face our greatest rivals in what is still one of football's greatest games. However, the atmosphere will be markedly different from recent years. First of all, relations between the clubs are as bad as they've ever been so there will be very few bears present - only 800 in fact, most in restricted viewing positions well out of sight of the Sky TV cameras. Secondly, Celtic seem to be suffering themselves with dressing room problems: key players falling out with managers and one goal-scoring talisman being sold. The dynamic seems to be one of promises not being fulfilled, broken trust, suspicious fans and banner protests. Finally, and most importantly, we have a team that can compete. Not just physically but, as we've seen several times this season already, mentally too. Self-belief is a vital component of any successful team - Celtic show that continually against us whilst we've faltered time and time again since our return to the top flight. Make no mistake, our form has shown we can get a result on Sunday. Even so, one of our bigger failings in our various Old Firm humblings of the last two years has been our predictability. A blind man could usually pick our team, guess our system and know where to hurt us. We only needed to concede a goal to fall apart and rarely looked like scoring ourselves. For the most part, we were beaten before the whistle was even blown. This weekend that need not be the case. Sure, Gerrard has preferred a 4-3-3/4-2-3-1 most often this season but last week deployed a 3-5-2 that, despite three defensive mistakes not immediately linked to the formation, worked not too badly (in the first half at least). It (or perhaps a 3-4-3) will be used again during this campaign with the loan capture of Joe Worrall from Nottingham Forest increasing our defensive options as well. Moreover, Gerrard hasn't been afraid to rotate his team - in particular his midfield five - so there's no obvious starting XI for Sunday (though I do try to predict this below)! The biggest issue for the Rangers manager will be that of the schedule discussed above. Despite obvious improvements in fitness, players will be tired (at least later in the game) and player indiscipline/officials incompetence won't have helped on Thursday evening. A nine hour overnight flight, just two full days of recovery and only light training drills isn't ideal preparation for any game, never mind away to Celtic, but they played on Thursday too and may not have their usual spring in their step - even if they could afford the luxury of resting key players. Fortunately, we can make changes too. Depending on the system used we can bring in a few players and, ironically, Morelos' daft red card afforded him an extra hour's rest on Thursday. Although I wouldn't rule out a back three, I do expect us to play a four on Sunday as it would be a big risk to bring in Worrall for his debut. 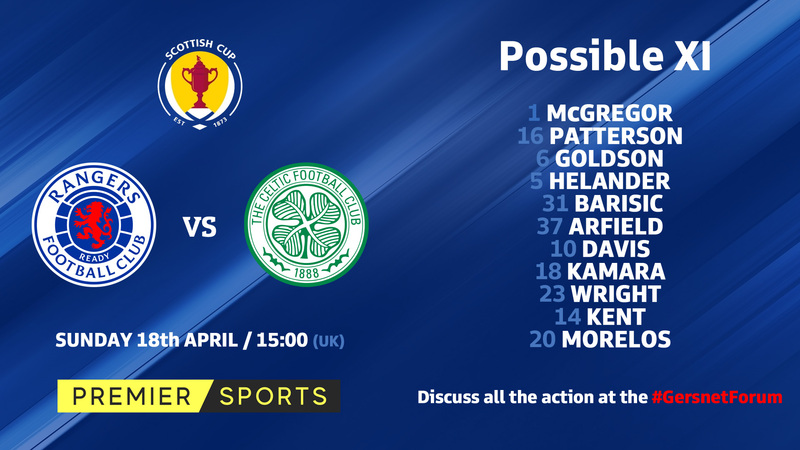 McGregor will of course start in goal and Borna Barisic likely the only change to our usual defensive line up. Worrall, Jon Flanagan and erstwhile captain Lee Wallace do offer other options though. In midfield, Lassana Coulibaly has returned to training but may have to settle for a place on the bench though his return might well have been kept as a nice surprise for this game. The likes of Jack, Ejaria, Arfield and Halliday have done lots of good work of late and a combination of those four will surely start. Ross McCrorie may be a wild card should the manager wish for fresh legs and mobility in the engine room. That leaves us three players in attacking roles. Daniel Candeias has never really got going this season but might be preferred to aid James Tavernier on the right side and press high centrally. Ryan Kent has done well on the other flank but with Morelos apparently forgiven for his Ufa immaturity and likely to start, I do wonder if Kyle Lafferty will play on the left. Albanian winger Eros Grezda will hopefully turn out to be a big player for Rangers this season but I don't think we'll see him until after the international break. Glenn Middleton is another option and I do wonder if his pace and direct play could add some doubt to any Celtic defenders? Ultimately, this game will arguably come too early for a few players so I think the manager will opt for familiarity at the expense of freshness. In that respect, we're asking a lot of the potential line-up below but the belief obtained from Thursday's draw and the adrenaline from an Old Firm clash should at least see us through the bulk of the game. After that we're reliant on making the right subs at the right time to deliver the kind of positive result we've lacked against Celtic of late. Another top class defensive display will be needed and our attackers, particularly Alfredo Morelos, must make the most of any chances that come their way. In conclusion, coming away from the East End of Glasgow unbeaten on Sunday would cap off a fantastic first three months in charge for Steven Gerrard. However, god forbid if his team were to return to Ibrox empty-handed, it wouldn't be the end of the world either - not when the full context is applied - so in essence we have nothing to lose with the vast majority of another long season still to be played out. No matter the outcome, the league won't be won nor lost in early September but we do have a chance to lay down an early marker and show we are indeed the real deal.